This week's Photo Of The Week is a very interesting orphan, photographed by one of the premier American photographers, Frederick Gutekunst. I purchased the photograph as one of a lot in an auction. Using the rule I have constructed for what constitutes a collection (three of anything), I have three Gutekunst photographs, so I have a Gutekunst Collection. I would like to acquire more photographs, but the cost of his work on any photograph of significance has become prohibitive (at least on my budget). I was drawn to this particular little girl because of the sadness in her face. Looking at her I wondered just what had caused someone so young to be so sad. A little research answered the question for me. My little girl probably wasn't sad, as this appears to be a favorite pose of the photographer Gutekunst. I found several photographs of women taken by Gutekunst with the very same expression of melancholy (photograph to the right is of Edith W. Pierce looking rather sad). If Gutekunst's purpose was to draw you to his work, he accomplished his purpose. I was hooked enough to buy the entire lot based on this little girl. The photograph has been identified on the verso, but as you know, a good detective will never assume that the information is correct. The information must be investigated. That is what follows with the analysis of "Sallie Beazly - Photographed by Frederick Gutekunst." (1) The card mount measures 4 1/4 in. X 6 1/2 in. and is 0.82mm thick. The corners of the card are rounded. The card stock is creme color front and back. There is a photographer's imprint on the front and back of the card. The photograph is marked copy and may be a copy of a daguerreotype, ambrotype, or cabinet card previously done by this photographer. 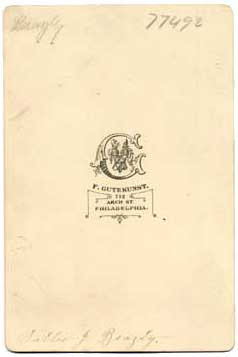 (2) The photographer’s imprint on the front (recto) of the photograph lists the photographer as F. Gutekunst Philadelphia. There is no address. (3) Handwritten on the back of the mount, in what appears to be period writing, is Sallie J. Beazly. The photographer's imprint is a coat-of-arms followed by F. Gutekunst, 712 Arch St., Philadelphia. The card is consistent with the Cabinet card, introduced in the United States in 1866. The color of the card and the thickness indicate a date in the 1880s. F. Gutekunst was Frederick Gutekunst, born 25 September 1831, in Germantown, Pennsylvania. He died at his home in Philadelphia, 27 April 1917, at the age of eighty-five years. 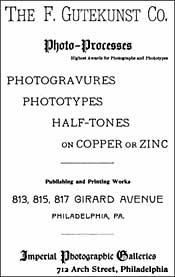 In 1856 he opened his photographic studio at 706 Arch Street, Philadelphia. His business grew with the growing demand for pictures during and after the Civil War which led him to add the upper floors of No.704 Arch Street to his gallery at 706. In 1883 he moved to his gallery at 712 Arch Street. January 25, 1886, he suffered losses in the amount of $10,000 in a fire at 715-719 Arch St., Philadelphia. A glance at the famous Gutekunst windows on Arch Street, Philadelphia, psychologically demonstrates the quality idea in photography. In these windows are displayed in a simple manner striking portraitures of many of the greatest men and women of the world. It is a notable art gallery, free for all passers to enjoy, and each day thousands of people take advantage of the opportunity. The Gutekunst windows are “dressed” in such plain, dignified style that a quality atmosphere is permanently secured. 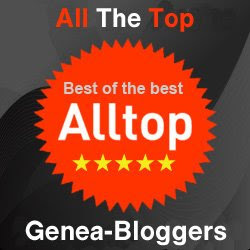 One comprehends at a glance that only the finest work can be procured at the Gutekunst studios. No marked-down price tags are on any of the pictures in these windows; there are no fancy trimmings or extraneous decorations to distract the eye from the exhibition. The appearance of many of the photographs, however, is enhanced through their artistic mountings, and all are arranged with exceedingly good taste. He was known for his celebrity photographs of men eminent in their professions, and his collection of negatives of distinguished characters was unequaled. The number of national celebrities whose picture he took, some nearly life size, was legion. Among the great pictures are those of William McKinley, Grover Cleveland, Carl Schurz, William Cullen Bryant, Henry Wadsworth Longfellow, Walt Whitman, and Ulysses S. Grant. He photographed all the eminent soldiers of the Civil War and was on the field at Gettysburg ten days before Matthew Brady. In 1877 he completed a photograph of the Philadelphia Exhibition grounds that was probably the largest photograph on a single sheet of paper in the world at the time. The sheet of paper on which it was printed was 10 ft. long and 18 in. wide. 1878 - Mr. Frederick Gutekunst, of Philadelphia, photographer, was distinguished as the recipient of the Cross of the Knights of the Austrian Order of Frans-Joseph, conferred by the Emperor of Austria on Mr. Gutekunst, because of the excellence of his productions in photographic art. When Gutekunst died in 1917, his Arch Street studio had been active since the Civil War era. The executor of his estate ordered the building emptied, in order to see it. According to family lore, a group of college students spent a day tossing the contents of the building into dump trucks, parked below. Wooden box after box packed with glass negatives was heaved from the windows of what was once the city’s most prolific portrait studio. January 25th, 1886, in Philadelphia, Mr. F. Gutekunst suffered a great loss. The loss of valuable negatives was very large, and while a small fraction of them remain, great numbers have been destroyed. His prototype rooms were not injured, being two blocks off. 1876 - A suit concerning a photograph of General Ulysses S. Grant was made by the photographer Frederick Gutekunst of Philadelphia. Copyright for the photograph of Grant had been duly entered in the District Court of the United States for the Eastern District of Pennsylvania, but a chromo-lithograph of the picture was published by Weise and Company without regard for the copyright. In the suit brought by Gutekunst, the Court decided against the photographer on the grounds that the copy of the photograph which the lithographer had purchased was not marked in accordance with the requirements of the copyright law. The photographer had contended that his copyright notice, which appeared on mounted albumen prints was sufficient to protect his interests even though the notice did not appear on prints sold separately from the mounts. Registering Photographs For Copyright - After 1865 the law required that copies of photographs registered for copyright must be forwarded to the Office of the Librarian of Congress. I found Sallie J. Beazly living with her sixty-year old widowed mother J. Annie Beazley in Camden, New Jersey, in 1910. Sallie, born in Pennsylvania, is thirty years old at this time and is single. The census indicates that Annie is living on her own income. We know from the research on Gutekunst that most of his clients were wealthy. I doubt the middle or lower class frequented his studio and rubbed shoulders with Walt Whitman or U.S. Grant. While the widow Beazly and her daughter Sallie don't appear to be working class (living on their own income), they are however, surrounded on Berlin and Gibbsboro Road by many people who are working class earning their living in a paint factory. Sallie is a child in the photograph. 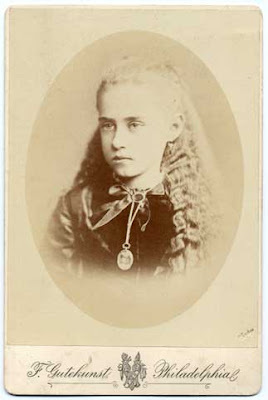 If we estimate her age at approximately eight years old in the photograph (for the purposes of analysis), the original would have been taken in about 1888. A census search for Beazly in all forms of its spelling returned only the one entry for Sallie J. I can not be certain this is the Sallie J. in the photograph with only one documented source. The free flowing locks are consistent with a girl no older than twelve. Were she thirteen or older her hair would have been pulled back from her face in a bun at the nape of her neck or on top of her head indicating a grown-up innovation. Photography was an invention of the Victorian era (the Victorian era encompassed the years 1837 to 1901, the reign of Queen Victoria), and photographic jewelry represented a permanent way to document beloved friends and family. Since the opportunity to be photographed was not as prevalent as it is now, a photo was a precious thing. Worn as brooches, cuff links, fobs and pendants, these faces from the past were often mounted in non-precious metals under crystal or celluloid covers for protection. I have found a similar photographic locket in a portrait worn by a thirteen year old girl taken ca. 1888-90. It has been determined that Gutekunst operated his photography business in Philadelphia, Pennsylvania from 1856 until his death in 1917. The card indicates the 712 Arch Street address. Gutekunst operated his photography business at 712 Arch St. from 1883 until his death in 1917. The photograph could have been taken between 1883 and 1917. The card is marked copy, but does not contain a copyright notice. The young girl may not have been a celebrity warranting the retail sale of her photograph, therefore not requiring the expense of a copyright notice. The card itself is consistent with the date 1880 to 1917. If the Sallie J. Beazly in the census is the same Sallie J. Beazly as the girl in the photograph and she is eight to twelve years old, the photograph would have been taken between 1888 to 1892. This is consistent with the analysis of the card, the photographer, and Sallie J. Beazly. This is far too much supposition and too little proof, but does show the process of analysis. Ettinger, Roseann. Popular Jewelry 1840 - 1940. Atglen, Pennsylvania: Schiffer, 2002. Linkman, Audrey. The Victorians, Photographic Portraits. London: Tauris Parke Books,1993. MacPhail, Anna. The Well Dressed Child. Atglen, Pennsylvania: Schiffer, 1999. Mace, O. Henry. Collector's Guide To Early Photographs.Iola, Wisconsin: Krause, 1999. Nickell, Joe. Camera Clues. Lexington, Kentucky: University Press of Kentucky, 1994. Severa, Joan. Dressed For The Photographer. Kent, Ohio: Kent State University Press, 1995. 1910 U.S. census, Camden County, New Jersey, population schedule, Voorhees Township, p. 82, dwelling 99, family 100, J. Annie Beazly (Head); digital images. Heritage Quest (http://persi.heritagequestonline.com/ : retrieved 2 May 2008); citing NARA microfilm publication T624, roll 858. Sallie J. Beazly. Photograph (Cabinet Card). ca. . Digital image. Privately held by the footnoteMaven, [ADDRESS FOR PRIVATE USE,] Preston, Washington. 2007. Gutekunst. 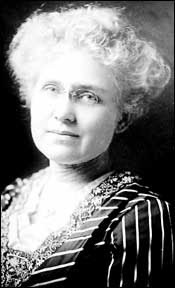 Edith W. Pierce. No date. Library of Congress Prints and Photographs Division Washington, D.C. 20540 USA. Current location of original document. Prints and Photographs. 10 May 2008 . The F. Gutekunst Company. "Advertisement." Photographic Mosaics: An Annual Record Of Photographic Processes, 1895, p. 48. I have recently received a photo of an ancestor, that was taken by F. Gutekunst at the 712 Arch St. Address. This ancestor was a Doctor b.1852, Died 1915. Your information on the timelines is great. Thank you. I can sumise that the picture I have was taken about 1890. Thank you for the information; F. Gutekunst was my great great grandfather and I knew very little about him other than he was a famous photographer. I had recently been told he has visited the Gettysburg site and was so sickened at the waste of lives he packed up and returned to Philadelphia. I am only recently seeing some of his amazing photographs. You are most welcome for the information. I am so pleased that it has been found by a member of his family. The life of Gutekunst is a personal favorite.